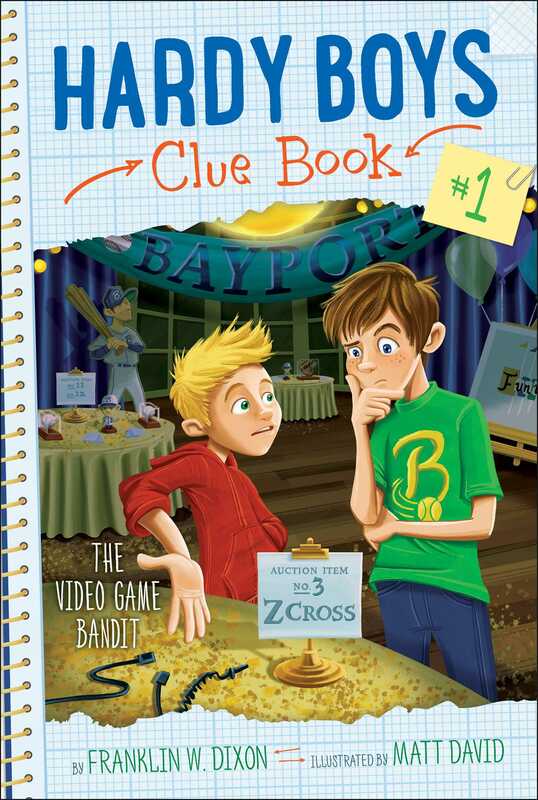 Frank and Joe are on a mission to track down a thief in the first book in an all-new, interactive Hardy Boys chapter book mystery series. Includes space for readers to jot down their own ideas and solutions to the case! “This way, over here!” Frank Hardy called out. He waved his arms back and forth, signaling his younger brother, Joe. Joe walked across the backyard with a stack of folding chairs. They were kind of heavy, and his face was beet red after carrying them over to Frank and their friend Ellie Freeman. Frank and Joe’s baseball team, the Bayport Bandits, was having a big fund-raiser. They were hoping to go to Florida on a team trip and play a few friendly games with other teams. In between games the team would be at the beach, snorkeling, paddleboarding, and learning how to surf. Ellie’s parents had volunteered to host the fund-raiser at their house. They had a big backyard, where they would auction off prizes in honor of the Bayport baseball team. People from all over town had donated things for the auction—a meal at Chez Jean, the fanciest French restaurant in Bayport, sailing lessons, art classes, and a shopping spree at Blair’s Boutique, a cute new store in town. “What do you need next?” Joe asked Ellie. He dropped the metal chairs on the ground with a clatter. “Sounds like we’ll be in Florida in no time,” Joe laughed. He unfolded a chair and set it down next to one of Ellie’s. With twenty-five kids on the team, it would be expensive to fly everyone down and have them stay at a hotel. They’d already had a bake sale and a car wash. With this huge event, everyone was hoping they would raise all the money they needed to bring every member of the team to Florida for free—or at least to pay for everyone’s plane ticket. As Frank and Joe helped Ellie set up the rest of the chairs, Mrs. Freeman came out, followed by Phil Cohen, a friend from school. He was carrying a small speaker that he put down by the side of the stage. “You guys remember my friend Biff, right?” Phil asked. He pointed over his shoulder. A tall blond boy came out of the house with the other speaker. He was wearing a blue T-shirt with the word TIGERS written across it in orange script. Right behind him was a basset hound puppy with long, floppy ears, who scampered down the stairs, tail wagging. Before Frank or Joe could even respond, the puppy jumped up on them. Frank crouched down as the puppy covered his face with wet kisses. Biff ran over, grabbing the back of the puppy’s collar. “Come on, Sherlock! Down!” he commanded. “Sorry, he’s still learning,” Biff apologized. “Let’s hope!” Mrs. Freeman said. Sherlock sprinted across the lawn, his ears flying up behind him. He grabbed a branch that had fallen from a nearby tree and started chewing it. As Frank and Joe helped Ellie with the tablecloths, Phil and Biff went to work on the sound system. Frank looked over at Biff, trying to remember the last time he’d seen him. Phil had been friends with him for a long time, but Biff didn’t go to the same school as they did. Frank and Joe usually only hung out with him at Phil’s birthday parties every year. All of them stopped what they were doing when they saw what Mr. Fun had brought. “Is that what I think it is?” Phil Cohen asked excitedly. He studied the box in Mr. Fun’s hand. He was holding a ZCross5000, a video game system that had just come out the month before. Every kid at Bayport Elementary wanted one. “The ZCross5000!” Mr. Fun said. “You bet it is! I waited in line at the store for five hours the day it came out. Then I came home, only to find out Mrs. Fun had already gotten me one for my birthday. Figured you guys could use the extra for the auction. Oh . . . and these!” He held up some free passes to Fun World, his arcade. Frank and Joe grinned. Mr. Fun had given them a whole stack once, after they’d solved a mystery at the arcade. They were known around Bayport for helping people find missing pets, stolen bikes, or even jewelry. Just a month before, they’d helped figure out who had played a prank on their good friend Chet Morton. Mrs. Freeman and Ellie had climbed onto the stage. They unrolled a large banner that said THANK YOU FOR SUPPORTING THE BAYPORT BANDITS! The Freemans had put large wooden posts in the ground, and Mrs. Freeman and Ellie hung the banner in between the posts. Ellie took a few steps back, trying to get it in just the right spot. “How does it look?” she finally asked. “Perfect,” Joe said. They all stood there, staring at the backyard. All the chairs were set up in rows now. With the decorations they had already put up, the backyard was looking great. Mrs. Freeman had even put floating candles in the pool, which looked pretty fancy. “Or snorkeling,” Ellie chimed in. “Or playing beach volleyball,” Joe added. He pointed to Frank, Joe, and Ellie. They headed inside, Phil, Biff, and Sherlock following behind them.